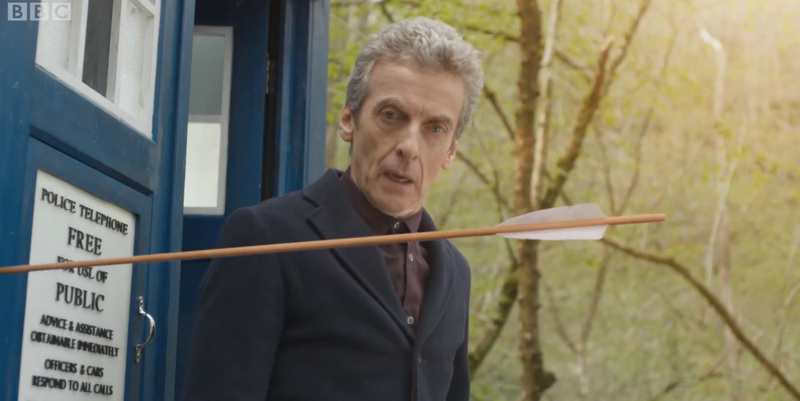 Continuing the theme of this season, last night’s episode of Doctor Who gave us another look into who Capaldi’s Doctor is and what he thinks of himself by juxtaposing him with one of the most famous heroes of legend: Robin Hood. Considering one of my all time favorite movies is Mel Brook’s Robin Hood: Men in Tights, you can imagine how much I was looking forward to another humorous and exciting look the character. Though whether you’re a fan of Robin Hood or the Doctor, “Robot of Sherwood” had something for everyone without feeling even slightly contrived or cheap. Thus far the Doctor’s been compared to the lonely T-Rex, the Clockwork Cyborg who couldn’t remember his original face, and the ‘Good Dalek’. This time, instead of the Doctor discovering who he is compared to a villain, he is put up against a legendary hero whom he refuses to believe is real. When these two ego-driven, self-doubting heroes collide, we not only find out who the Doctor is, but also who he thinks himself to be. We find that this Doctor isn’t too inclined to believe in heroes, which means on some level that he doesn’t even see himself as one. Sure he can joke to Clara about saving people being his hobby; but he is really focused on this ‘darkness’ he believes exists within him. From being ‘the man who can’t remember his face’ to someone filled with so much hatred it’s beautiful, this new Doctor is struggling with who he is and what he thinks himself capable of. When the Doctor tells Robin that he’ll be forgotten in history and will exist only as a legend, he’s shocked that Robin is happy about this. Robin remarks to the Doctor that “History is a burden; but stories can make us fly”; and that is exactly what is happening to the Doctor right now. He is literally “burdened” with his own history and has lost all faith in himself, which doesn’t make him too different from Robin himself. We know Robin is burdened by what Marian would think and how he acted that day; but in the end we see Robin rewarded and have his happily ever after. Will the Doctor have his happily ever after? Who knows; but now he’s seen that heroes can exist. It’s fitting that the Doctor is treated as a hero and is kissed by Maid Marian right before he learns that Robin Hood is real. In this way, the Doctor is already wondering ‘maybe I can be a hero’ right before his disbelief is shattered when Robin is revealed to be the actual legendary hero. Though whether the Doctor is a hero or not, it’s how people see him that’s important – as Robin reveals. We know Marian and the other prisons saw him as their hero – and that Clara sees him as the ultimate hero – ; and that’s what matters most. Just like how last episode Clara said that what’s important is that the Doctor TRIES to be a good man, here we see that it’s important to have people BELIEVE in you as a hero. For if people have an example of a hero, they themselves in turn have someone to aspire to be; and thus inspire more heroes of there own. I guess in this sense heroism is contagious. One huge parallel between the Doctor and Robin Hood is most definitely ego. From their archery contest to squabbling over who has the better plan/can get the key first, there’s not enough room in Sherwood forest for these two egos to coexist. Thankfully Clara has them both under control. When the guard came in and took Clara away because he thought she was the one in charge, it wasn’t a mistake. She’s traveled with two different Doctors now so she knows how to handle an ego, which is why she was perfect at playing Nottingham. Clara balanced both the Doctor’s and Robin’s egos this whole episode. So when it came time for her meeting with Nottingham, there was no doubt in her mind that she could be ‘clever’ and get the information out of him. This whole Season thus far Clara has really stepped up and been amazing. I’m glad she is getting to show herself again as not just a ‘damsel’; but as the clever girl who can do the impossible. You might even say she’s the ‘impossible girl’ – sorry, couldn’t resist. In The Day of the Doctor, the War Doctor described the Tenth and Eleventh Doctors as ‘the Doctor who regrets’ and ‘the Doctor who forgets’ respectively. The Tenth Doctor had some of Elevens joking and fun-loving attitude; but also maintained some of the inner rage and turmoil felt by his predecessor the Ninth Doctor. Where Twelve falls in all of this is something that’ll be explored all season; but he is certainly much more series than any of his recent predecessor. That being said, his humor – or attempted lack their of – is completely reminiscent of the Ninth Doctor. He’s the straight man full of insults. He’s not trying to be funny when he puts you down; he’ll just put you down – and he’s awesome at it. Seeing the juxtaposition of the Doctor and Robin Hood worked especially well in bringing this out. Robin laughs at everything and makes light of any situation. The Doctor on the other hand is the exact opposite. Whether mocking Robin and his men as “Simple” or saying they’re going to give themselves hernias, the Doctor is actually uncomfortable around all this laughing and joking. This was probably the funniest episode I’ve seen in a while; and most of it comes from the awkward polar opposites that are the Doctor and Robin Hood. In fact, this again reminded me of the Ninth Doctor and how he interacted with Captain Jack Harkness. Seeing the overtly sexual and forward Captain Jack make the Ninth Doctor confused and uncomfortable was always fun. That’s the beauty of having opposites; they bring out new qualities in and push each other. Now I’m not saying Robin Hood will return as an occasional companion for the Twelfth Doctor; but my God that would be incredible. 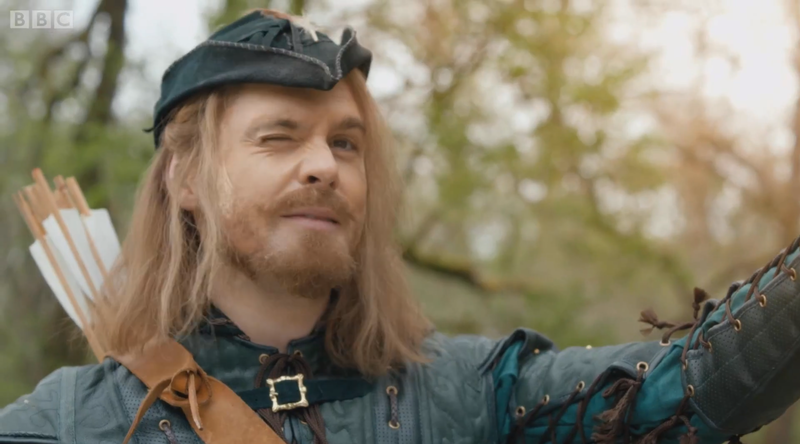 As I mentioned at the start of this article, I love Mel Brook’s Robin Hood: Men in Tights. So I was very happy to see some reminiscent elements in this episode. 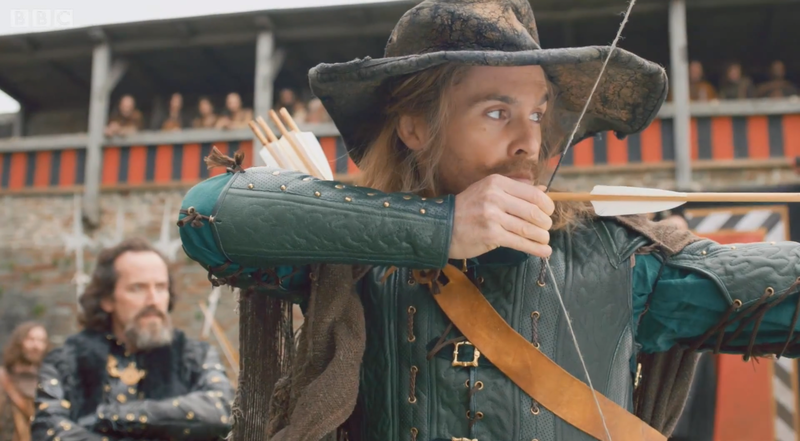 Now I’m not just talking the Sheriff of Nottingham stupidly punching a robot and hurting his hand; nor the ‘splitting the arrow in twain’ archery contest scene – because that’s a famous Robin Hood story. I’m actually referring to some of the subtle humor that satirizes other media forms. For example, when the Doctor purposefully offers himself to get captured because ‘it’s the easiest way to learn the villain’s plan’. Again, this is a very minor thing; but this pointing out of usual story elements was one of the great things about this episode and called to mind many past humorous and satirical works. It’s a tale as old as time, or at least as far as Doctor Who is concerned: Robot seeks human help, human thinks he/she’s in control, robot screws over the human. Though this time around the outcome was a little different. Sure the human lost; but it was basically he himself that caused his eventual demise as well as that of the robots themselves – or was it? What if it wasn’t Nottingham’s foolishness that killed the robots, but was actually all part of the robots plan from the start? Is The Promised Land outside of time and space or is it a physical destination? As we heard the robots comment, their original destination was “The Promised Land” and it’s where they seek to go. Aside from ‘the promised land’ being the ‘Bad Wolf’, ‘Torchwood’ of this season – recurring element/name that is fulfilled and explained in the finale – it’s entirely possible that these robots knew exactly where and what the Promised Land was. So if “the Promised Land” is some place of death, does that mean you can only get there by dying? Did the robots know what would happen if they tried to take off and thus had to die to reach “the Promised Land’? We know that the Clockwork Cyborg and his crew were also trying to reach “the Promised Land” – either originally or after their being stranded – and there was no attempt on their part to suicide; but rather to physically travel. Then again, the last two beings we saw enter “the Promised Land” were indeed dead. One way or another, I’m willing to bet this episode’s robots made it there in the end. I guess we’ll have to just keep waiting for more information as it becomes available. Three episodes into this Season and each have honestly been better than the last. It’s important to note that this episode was written by Mark Gatiss, who has written a few Doctor Who episodes in the past when he wasn’t working on Sherlock. Though despite Gatiss nailing this episode, part of me is afraid that when I least expect it Moffat is going to pull a Moffat and make things far more convoluted than they have to be. Whatever the future holds, I’m just enjoying this new Season one step at a time and will handle any curveballs as they arrive. See you next time Whovians!